I came in one Saturday to help my mom choose the car of her dreams, next thing you know I come out with a brand new Dodge Ram. Thanks to the excellent care and looking out of Fred Anguiano and the finance specialist Irene Porras. She worked the hell out of the calculator to make the numbers work for me to come out with a new truck. I had no intentions of buying a vehicle but they work with you and make you feel at home that it’s hard not to. Thank you Fred and Irene for an excellent experience both vehicles are wonderful! Need a vehicle?? 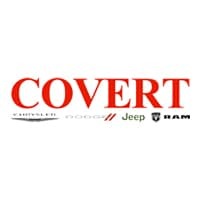 Fred and Irene are your go to at Covert Dodge. Five star service here. Buck Ashcraft was an amazing sales rep. He really walks you through all the details of the process. I didn't at any point feel like I was being pressured to spend more than my budget and I felt like he worked hard to make money stretch as far as possible. If your in the market for a car I highly suggest going here.